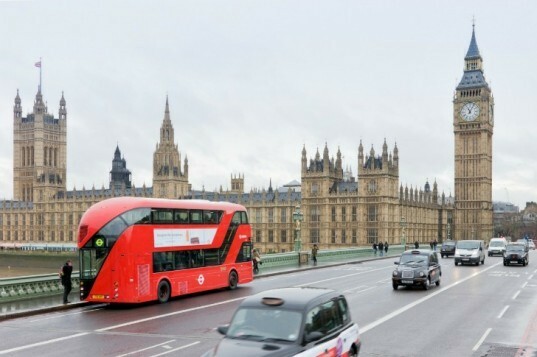 We've been following the evolution of London's hot new hybrid double-decker bus design and we're excited to announce that the real live version recently hit the streets! 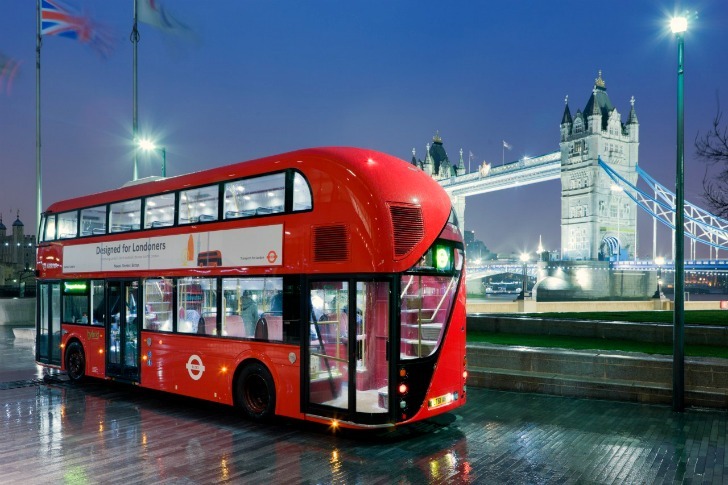 Designed by Thomas Heatherwick in collaboration with specialist bus manufacturer Wrightbus, the new double-decker bus takes inspiration from the 1950s era Routemaster. The new design features an open platform on the back to help streamline loading and unloading for passengers. Not only is the new bus super shiny and stylish - it's also way more fuel-efficient than current buses on the streets. It’s been 50 years since the Transport for London commissioned and oversaw the development of a bus built specifically for the city. So it was high time they got a new bus and the new design harkens back to the vintage buses with plenty of modern updates. The open platform on the rear, which was one of the favorite features of the older buses, helps passengers hop on and off quickly. The new bus also has three doors and two staircases to streamline passenger boarding. The exterior was designed for both form and function and the asymmetrical front window allows the bus driver to get a better view of the curbside action. Another glazing panel wraps around the bus reflecting passenger circulation, which brings in more daylight and opens up the interior for views. As for fuel efficiency, the bus is 15% more efficient than existing hybrid buses and is 40% more efficient than conventional diesel double-deckers. The double-decker bus is the first of what will hopefully be a new fleet of buses for London. If i wanted them to build me a bus how would i go about contacting them? Eventually i would like to have a touring bus and absolutely love their double Decker design. It's been 50 years since the Transport for London commissioned and oversaw the development of a bus built specifically for London. So it was high time they got a new bus and the design harkens back to the vintage buses with plenty of modern updates. The open platform on the rear, which was one of the favorite features of the older buses, helps passengers hop on and off quickly. The new bus also has three doors and two staircases to streamline passenger boarding. The exterior was designed for both form and function and the asymmetrical front window allows the bus driver to get a better view of the curbside action. Another glazing panel wraps around the bus reflecting passenger circulation, which brings in more daylight and opens up the interior for views. As for fuel efficiency, the bus is 15% more efficient than existing hybrid buses and is 40% more efficient than conventional diesel double-deckers. The original 1950's Routemaster double-decker bus for comparison.